Arrive Istanbul Airport. Istanbul, the only city in the world built on two continents, guarding the precious relics of the three empires of which she has been the capital; a unique link between East and West, between past and present. Istanbul is not only historic, it is still a magnificent great city, fascinating and vividly alive, providing infinite variety: museums, ancient churches, palaces, great mosques, the bazaars and the unforgettable Bosphorus. Meet and transfer to the hotel in city center. After the check-in to the hotel, we will depart for a short orientation tour. The bus will drop us at Eminonu port where we will embark our private boat for a two hour relaxing boat tour along the Bosphorus, visiting both European and Asian shores of Istanbul. The boat trip is one way to theNorth. You will see the city’s most expensive villas, old palaces, two intercontinental bridges, minarets and mosques, etc. We will leave the boat in Sariyer where our bus and driver is waiting for us. Return to the hotel. Free time before the dinner. Dinner at an outside seafood restaurant. After breakfast, depart from the hotel. Morning visit to the Hippodrome Square where ancient chariot races were held, the Blue Mosque, unique with its 6 minarets, and famous for its blue Iznik tiles, and the St. Sophia Church, built in the 6th century, once was the largest Christian church in the world. Afternoon visit to the Topkapi Palace, Imperial Residence of Ottoman Sultans, with displays of priceless world-class collections of artifacts, jewelry and rare porcelain. We will also visit its seperate Treasury Section. Then visit the famous Grand Bazaar complex including 4,000 tiny shops. Dinner at an outside Turkish Grill Restaurant. After breakfast, depart from the hotel. Visit the “Glass Furnace”. Istanbul’s Glass Furnace is a new center for glass artistic creativity and an experimental production. The facility offers a series of educational programs year-round. The owner says: “One of our primary targets is to bring together Turkish Glass Art and, in this way, give new life to our gradually diminishing older art. I believe that progress in glasswork, as in all arts, is only possible through the encounter of different cultures and a sharing of experience and knowledge. The Glass Furnace team will be happy to host you.” We will spend three hours at the Glass Furnace and see some of the following classes: Glass Blowing with flat and stained glass, Mix Media / Lamp Work, Bead Making/Glass Printing & Painting, Mosaic Fusing & Slumping / Kiln Casting. Then, we will drive to Sariyer to visit the “Atli Kösk”, a private museum owned by Sabanci Family, one of the richest and well-known families in Turkey. We will see the many paintings from 19th century, daily life instruments from Ottoman period and other private collections of the Sabanci Family. Dinner at an outside restaurant. Return to the hotel for overnight. Then, drive to Bursa, once the capital of the Ottoman Empire. Visit the Silk Bazaar, Green Mosque and the Green Mausoleum. Dinner and overnight at the hotel in Bursa. First visit to Asklepion, the ancient Healing Center, served as a hospital. Famous pharmacist Galenos lived and died at this hospital and teached his first healing technics to the local people here. Galenos is considered as the "Father of Pharmacy". Galenos has accepted the principles and ways of treatment of Hippocrtaes who lived about 700 years earlier then him. At his home, he had a drugstore in which he prepared his herb based medicine which was called "Polypharmacy". He had medicine for almost every illness. His therapy based ointment "antidote" contained at least 70 different types of ingredients. He said "You will never endanger the life of the patient during the therapy". In this Asklepion "Faith" came first for the therapy. Today, it is possible to see the ruins of the ancient healing technics such as Sacred Water, Herbs and Ointments, Sun Bath, Theater for music and social events. Then we will visit the Acropolis, a city built by one of the generals of Alexander the Great. We will see the steepest theater of the ancient world, the Temple of Trajan, the city walls, and more. Then, we will continue to Izmir. Izmir, lies on the shores of a large bay furrowed by ships and yachts and encircled by mountains. The climate is a mild one and, in summer, the heat is tempered by the constant and refreshing sea breezes. Behind the palm lined promenades and avenues, the city gently ascends in terraces on the slopes of the surrounding hills. Today, it is third largest city in Turkey. Visit Izmir Ethnographical Museum; it is right accross the Archaeological Museum, a 3 floor-old building constructed in 1831 as an hospital, then converted to a museum in 1984. The museum displays traditional Turkish dresses, wedding dresses, Ottoman furnitures from late 19th century, hand arts such as tin processing, bath clog production, blue bid production, wooden printing, carpet weaving and more interesting daily life instruments. Dinner at an outside seafood restaurant. Overnight in Izmir. Drive Ephesus, the most famous ancient Roman city in Turkey, maybe in the world. See the House of the Virgin Mary, the Odeon, the Temple of Hadrian, the Celsus Library, the Marble Street, the Great Theater and the Harbour Road. 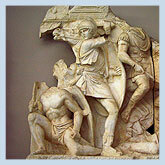 Then, visit the Archaeological Museum of Ephesus. Before driving to Kusadasi, shopping opportunity at Ephesus Ceramic Center. The color usedint the Hand Made Turkish Ceramics, especially the coral red, include complex mixtures and are very difficult to obtain and apply. These colors, which are obtained according to the traditional methods, reflect the shades of semi-precious stones such as malachite, coral, lapis lazuli and protect their luminosity for centuries. Then visit Borg Jewelry center on our way. Borg Jewelry expanded bringing enthusiasm, new ideas in design and variations on old traditional Ottoman motifs. Drive to Kusadasi for dinner and overnight. Drive to Aphrodisias, the city of Aphrodite or Venus, the goddess of love. The archaeologists named the city Aphrodisias because they found so many statues of her here. The New York University is leading and supporting the excavations financially. We will see the Stadium which seated 35,000 people and is the most well-preserved in the world, the Hadrian Baths, the Theater, the Agora and the Archaeological Museum where many Aphrodite statues are on display. Continue to Denizli to explore the glass blowing tradition in Denizli Glass Factory. Proceed to Pamukkale, the Cotton Castle. See the white travertines; there are underground hot water springs in Pamukkale. This water contains many minerals including calcium. The calcium deposits formed the white Pamukkale hill over thousands of years. The city of Hierapolis in Pamukkale was a spa center during the Roman period. There are still tourists coming to Pamukkale for its hot spring waters. Dinner at the hotel. Swimming is available at the indoor or outdoor hot spring pool of the hotel. It is said that this water is good for the eyes and for the stomach. In the morning, we will visit a carpet manufacturing company, a private handicraft center supported by the government to keep the carpet manufacturing tradition alive in the Honaz Mountains area. We will see the procedure of the famous hand made silk carpet weaving. Then drive to Konya. Visit Konya Mevlana Museum. Visit the Karatay Tile Museum and the Medrese which was one of the first universities of the Ottoman Empire. Then visit the local craftsmen such as felt makers and horse carriage decorators. Check-in to the hotel. Dinner and Show at the hotel. We will have the chance to watch a fascinating show; the special dance of the Whirling Dervishes. Drive to Cappadocia. Visit the 13th century Sultan Hani Caravanserail en route, enjoy Turkish tea in an authentic atmosphere. Afternoon sightseeing in Cappadocia. As a result of two explosions, the area was covered with volcanic matter to a height of 100 yards. As it was easy to carve these volcanic stones, local people built underground cities and cave churches in Cappadocia. In the afternoon, we will visit the 10th century underground city of Kaymakli. Dinner at the hotel. Tonight, we will sleep early for an early rise the next day to experience a unique hot air balloon trip over the spectacular volcanic landscape of Cappadocia. We will leave the hotel at 6 a.m. without having breakfast for an unforgettable balloon trip over Cappadocia. The balloon trip is only available between April-October (sometimes in March and November too; the weather must be good), when the weather is calm and only early in the morning, usually before 8:00 am. The trip ends with a champagne breakfast. After breakfast, we will visit Goreme Open Air Museum including many painted rock churches, the Citadel of Uchisar, Avanos, the town of pottery makers, and watch a demonstration at a workshop. Tonight, we will have our dinner at an outdoor CAVE RESTAURANT with folk and belly dance show. Transfer to Kayseri Airport. TK 261 09:45 am escorted flight to Istanbul. Arrive Istanbul at 11:00 am. Our new bus and driver will transfer us to the hotel. After check in to the hotel, we will depart for an afternoon sightseeing tour. Visit the St. Chora Church famous for its golden mosaics, the Underground Cistern and the Turkish and Islamic Art Museum. Return to the hotel. Tonight, Farewell Dinner at a nice outside restaurant. Transfer to Istanbul Airport for departure. End of our services.